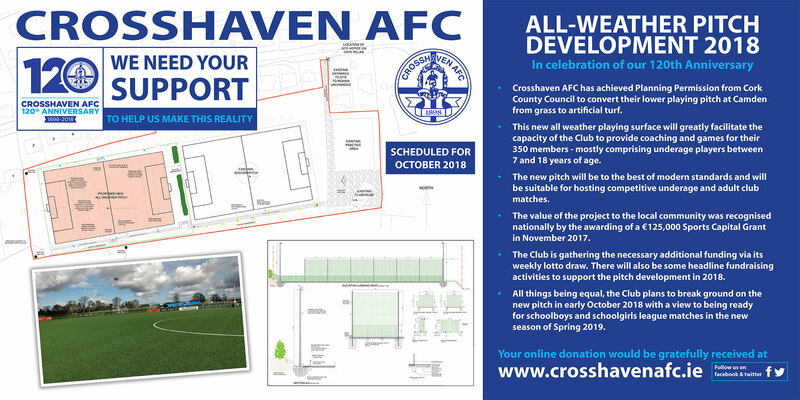 Crosshaven AFC has achieved Planning Permission from Cork County Council to convert their lower playing pitch at Camden from grass to artificial turf. This new all weather playing surface will greatly facilitate the capacity of the Club to provide coaching and games for their 350 members – mostly comprising underage players between 7 and 18 years of age. The new pitch will be to the best of modern standards and will be suitable for hosting competitive underage and adult club matches. The value of the project to the local community was recognised nationally by the awarding of a €125,000 Sports Capital Grant last November. The Club is gathering the necessary additional funding via its weekly lotto draw. There will also be some headline fundraising activities to support the pitch development in 2018. All things being equal, the Club plans to break ground on the new pitch in early October with a view to being ready for schoolboys and schoolgirls league matches in the new season of Spring 2019.